*Please indicate particular clinic; some restrictions may apply. Sign-up using the form or call us at 815-398-4410 today! Excess weight is a serious health problem for dogs and cats and is common in many countries. The two main causes of obesity are too much food and too little exercise. Other contributing factors can be due to hormonal influences, certain genetic factors, and other disease processes. Increase the risk of heart disease by forcing the heart to work harder. Increase the risk of arthritis as extra weight can stress the joints, cause joint pain, and make it harder for your pet to move around comfortably. Obesity can cause breathing problems, skin and hair coat problems. 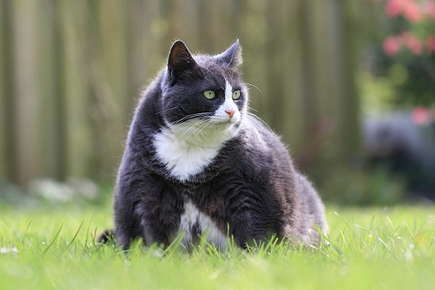 Especially in cats, obesity frequently leads to diabetes. All of these problems can make your pet uncomfortable and limit the way they interact with you and other family members. Treatment is to rule out and treat any medical causes, such as hypothyroidism. Reducing caloric intake and increasing exercise can help your pet successfully lose weight. Lifestyle changes and a weight loss program are essential. Your veterinarian can help determine if your pet is too heavy and provide guidelines for achieving their ideal weight. Slentrol is an oral weight loss drug for obese dogs that are not able to lose weight by other means.